The Indian philosopher Nāgārjuna (c. 150 – c. 250 CE) is probably the single most important Buddhist philosopher. 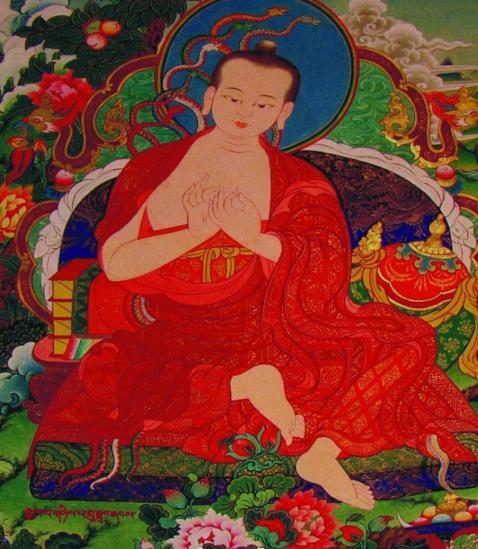 Nothing reliable is known about his life; modern scholars do not accept the traditional account whereby Nāgārjuna lived for some 600 years and became a Tantric wonderworker (siddha), although it is believed that Nāgārjuna was the teacher of Āryadeva (ca. 170-270 C.E.). 2) Vigraha-vyāvartanī (Countering Hostile Objections), verses extant in Sanskrit together with an auto-commentary, a reply by Nāgārjuna to his critics. Nāgārjuna saw his philosophy as itself part of the spiritual project of Enlightenment, of “seeing things the way they really are” (yathā-bhūta-darśana). His arguments should be placed in the context of Buddhist philosophy (preceding Abhidharma thought), which he both presupposed and the ontology of which he trenchantly criticized. It was Nāgārjuna who first explained philosophically the concept of Śūnyatā (Emptiness). It is the property of lacking intrinsic existence (niḥsvabhāvatā) as a result of being one way or another, the result of causal processes. Existing is nothing more than an intersecting point of causal factors. Nāgārjuna sought to demonstrate this by asserting that if something—say, a table—were more than just an intersecting point of causal factors, it would prove resistant to analytical de-construction. Absolutely nothing can resist the process of analytical deconstruction, investigating its coherence through reasoning. Thus Nāgārjuna’s works embody arguments in the style of a sceptic, debunking concepts like existence and non-existence, causation, perception, time, motion, and even religious concepts like the Buddha, or Enlightenment itself. Nāgārjuna also offers methodological reflections on what he is doing, why he is not a nihilist or even really a sceptic, and how his practice fits into the overall Buddhist project. For Nāgārjuna this project is a deep “letting-go,” which nevertheless also facilitates compassionate re-engagement. The Madhyamaka School of philosophy, which he probably founded, was the earliest of the two great Indian schools of Mahāyāna thought. In Tibet, Madhyamaka is said to represent the highest philosophical standpoint, the final truth. In East Asian Buddhism, the influence of Emptiness can be seen in Chinese and Japanese art, in poetry, in the martial arts, and even, ostensibly, in Japanese business practice.